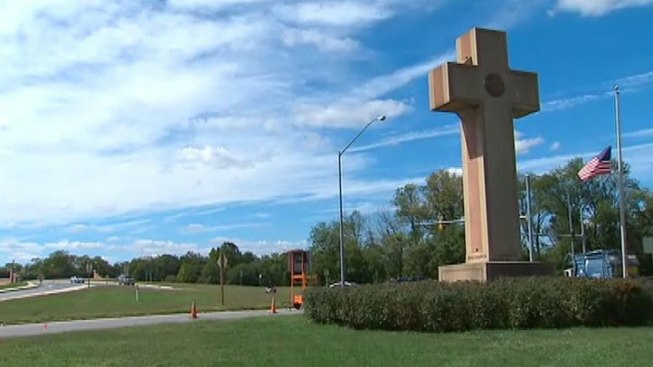 The Supreme Court has agreed to consider whether a nearly 100-year-old, cross-shaped war memorial located on a Maryland highway median violates the Constitution's required separation of church and state. The court announced Friday that it would hear the case. The memorial's supporters say the case could affect hundreds of similar monuments nationwide. A federal appeals court in Virginia had previously ruled against the approximately four-story-tall concrete cross. The judges said that it "has the primary effect of endorsing religion and excessively entangles the government in religion." But the Maryland officials who maintain the memorial told the Supreme Court that the monument's context and history show it is intended to convey a secular message of remembrance, not a religious message. The monument in Bladensburg, Maryland, was completed in 1925 to honor Prince George's County soldiers who died in World War I. In 2012, the American Humanist Association challenged the constitutionality of the cross, saying it endorses Christianity while ignoring non-Christian veterans. After the court ruled the memorial unconstitutional, Gov. Larry Hogan directed Maryland's attorney general to support a legal challenge against the ruling. NBC News' Pete Williams reports the Supreme Court's rulings have been notoriously erratic in the area of religious displays, and Justice Brett Kavanaugh's views probably won't differ much from those of Anthony Kennedy, who was willing to tolerate of a lower wall of separation between church and state.